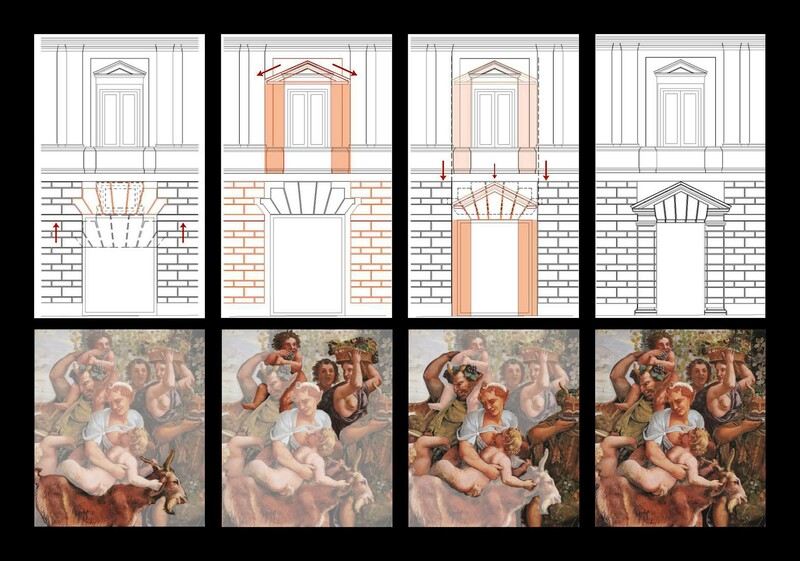 Mark Rakatansky, Transformative sequences in Giulio Romano’s Palazzo Stati Maccarani and Palazzo Te. Courtesy of the artist. Utilizing the latest software, an innovative set of digital techniques will be developed to provide more accessible, animated, and informative visual readings of buildings, providing new forms of critical and historical analysis. In this book these tools are used to investigate modes of transformation in Italian architecture and the related arts in the work of Giulio Romano in the sixteenth century, Giovanni Battista Piranesi in the eighteenth century, and Luigi Moretti in the twentieth century. The close readings of these works, and of prior readings of these works by pre- and post-war critics, explore the performative methods developed by these architects through tectonic and pictorial systems capable of responding to a confluence of cultural and social forces. In addition to contributing to the scholarship on these particular architects, the book will make their work and these historical periods emerge as much more resonant with regard to certain modes and problems in contemporary architecture. Mark Rakatansky, principal of Mark Rakatansky Studio, teaches at Columbia University. His designs and writings have appeared in numerous publications worldwide. His book Tectonic Acts of Desire and Doubt was published in 2012 by the Architectural Association as part of their Architecture Words series. Other recent and forthcoming writing includes "Byoung Cho's Between" in Byoung Cho (2014) and "The Transformations of Giulio Romano" in Giulio Romano e l'arte del Cinquecento (2014). His most recent design work includes Permana Residence, Open Stacks, Inner Liner, Summer Reading Pavilion (for Banned Books), and Recombinant Campus, a series of designs for Queens College. He has received a diverse range of awards in architecture, urbanism, and graphic design, including the Architectural League's Emerging Voices Award and the Progressive Architecture Award; his work has been exhibited in the Gwangju and Venice Biennales, and at the Getty Center, ICA, Künstlerhaus Stuttgart, Louisiana Museum, and Yale University.